The Hanshin Tigers are well into their annual summer jaunt away from Koshien Stadium as they make way for the National High School Baseball Championship. The Tigers, who left the park behind on Aug. 2 and won’t return until Aug. 28, are nine games into the so-called “Road Trip of Death” and have gone 7-2 thus far. The team is also in first place in the Central League. The next several days, however, will present a threat to their place atop the standings as they face consecutive road series against the second- and third-place teams in the CL. On a positive note, the Tigers go into this stretch with two foreign players, Matt Murton and Mauro Gomez, hitting well after struggling earlier in the year. Since Aug. 1, Murton is batting .465 with a homer and three RBIs, while Gomez is .394 with two home runs and 11 RBIs. Pitcher Atsushi Nomi is also on a roll. The Tigers left-hander has won his last four decisions and pitched at least six innings in each of his last five starts. Nomi didn’t allow more than two runs in any game over that span. Hanshin heads to Jingu Stadium on Friday for the start of a three-game series against the second-place Tokyo Yakult Swallows and their red-hot star Tetsuto Yamada. The Tigers are 9-7 against the Swallows this year, but have dropped five of their last six against the Birds. Hanshin has also had trouble holding down Yamada and slugging first baseman Kazuhiro Hatakeyama. Yamada is hitting .338 with six home runs against the Tigers, while Hatakeyama is .393 with five long balls. 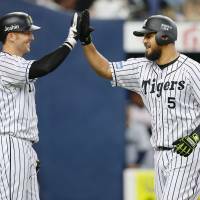 Hanshin will remain in the capital to take on the Yomiuri Giants at Tokyo Dome from Aug. 18-20. The Tigers are 7-10 against the Kyojin. Among the Giants, Shinnosuke Abe has posed problems for the Tigers. Abe is hitting .412 with a pair of homers and 12 walks, against two strikeouts, versus Hanshin. The Tigers may also have to deal with pitcher Miles Mikolas, who allowed just two runs over 13 innings, while picking up a pair of wins, in his last two starts against them. 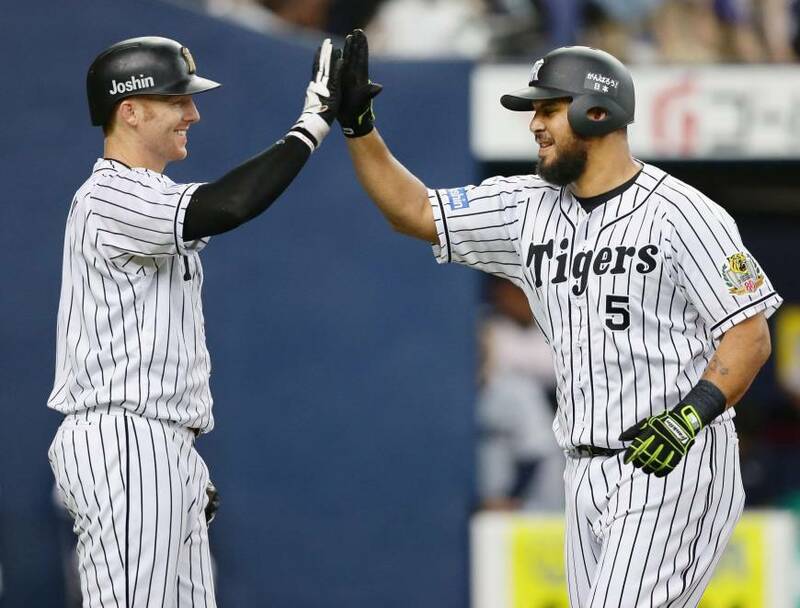 Because of the premium the NPB playoff system places on winning the pennant, the next six games could go a long way toward the Tigers’ hopes of a Central League title and the right to host each game in the Climax Series Final Stage. No no-nos: Hisashi Iwakuma’s no-hitter for the Seattle Mariners on Wednesday night was the fourth no-no in the major leagues this season. It was also the third by a Japanese pitcher in the majors — Hideo Nomo threw two during his career. Japan is still waiting for its first no-hitter this season. The last NPB no-hitter was thrown by the Seibu Lions’ Takayuki Kishi on May 2, 2014, against the Chiba Lotte Marines. There was one NPB no-hitter in 2013 and only Kishi’s in 2014. The majors saw eight during those two seasons. Japan experienced a surge in 2012 with three, but that came after a six-year dry spell. Perfect games are even more scarce. The last was by Yomiuri right-hander Hiromi Makihara against the Hiroshima Carp on May 18, 1994. Triple threat: Barring a few collapses, Japan won’t see a Triple Crown winner this year — the last was the Fukuoka Daiei Hawks’ Nobuhiko Matsunaka in 2004. While no one player will sweep the batting average, home run and RBI titles, two teams just might. Entering Friday’s games, Tokyo Yakult Swallows players led the three categories in the Central League. Shingo Kawabata was the batting leader at .336, Yamada had 26 home runs and Hatakeyama was tops with 80 RBIs. The Lions have their claws sunk in on the PL side, with Shogo Akiyama leading all batters with a .373 average and Takeya Nakamura pulling double duty with 32 home runs and 103 RBIs.